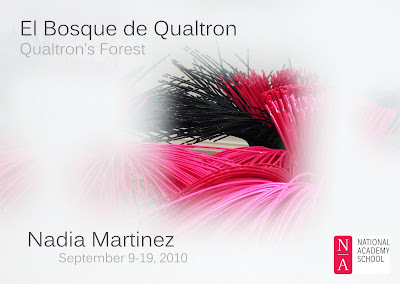 KiptonART Artist Nadia Martinez currently has a solo exhibition at the The National Academy School of Fine Arts. A recent graduate of the school, this opening launches the inaugural exhibition for the Diploma Program, a highly selective and prestigious curriculum. Martinez's "Me Bosque de Qualtron" is a sculptural installation of recycled materials emerging together in an intimate space. This exhibition is open through September 19th at the National Gallery Oval Gallery on the 2nd Floor. The gallery is open Wednesday - Sunday, 1pm to 5pm.